Kyle Busch has won six of the eight CWTS races he's entered in this year. Kyle Busch dominated the Lucas Oil 225 NASCAR Camping World Truck Series race at Chicagoland Speedway on Saturday night, a race that was scheduled for Friday but was postponed a day by rain. 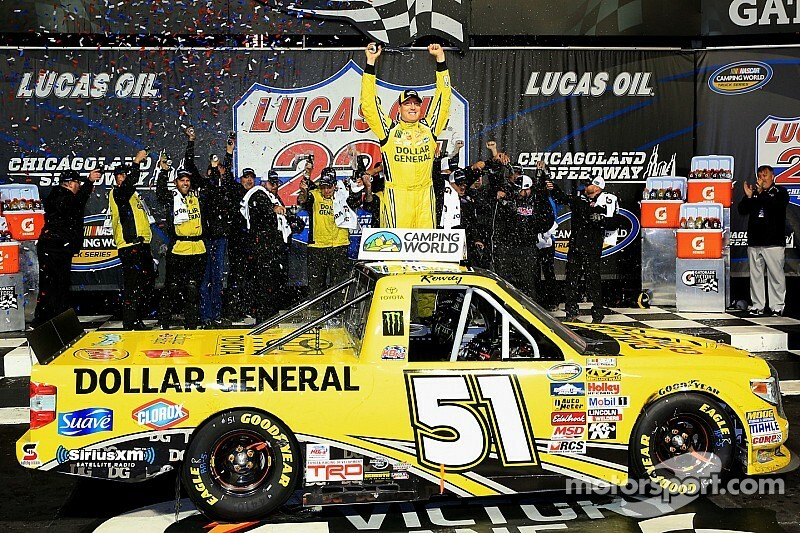 After racing from the back to the front twice, Busch led a race high 66 laps of the 150 that made up the race and claimed his sixth win of the year and his fourth Truck Series win in six series races at Chicagoland. "It was a great race for us tonight, and this Tundra was awesome," Busch said. "This Dollar General Tundra -- what can I say, man? It was fast." The No. 88 ThorSport Toyota of Matt Crafton finished second, handing Crafton the championship lead over ThorSport teammate Johnny Sauter. Sauter's No. 98 Toyota ran up front early, but he wound up in the back after a pit road speeding penalty in the final 50 laps. Sauter, who headed into the race with a seven-point lead over Crafton, finished 14th and dropped five points behind the new points leader. "We finished second to the damn 51 again," Crafton said. "All in all, it was a good race." The No. 20 NTS Motorsports Chevrolet of Austin Dillon finished third, the No. 19 Brad Keselowski Racing Ford of Tyler Reddick was fourth and the No. 13 ThorSport Racing Toyota of Jeb Burton was fifth. We'll just keep plugging away," Reddick said. "They (the No. 19 team) have a very young and very unexperienced driver behind them." Sauter started from pole after Friday's rain cancelled qualifying. Busch, meanwhile, started in the back because he didn't practice his truck, opting instead to have Erik Jones practice his truck while he focused on his Chase for the Sprint Cup. After starting 32nd, Busch tore through the field and was inside the top five in just 25 laps. By that time, Dillon had taken the lead from Sauter. Busch was third by the time the yellow flag waved for a competition caution on lap 30. He maintained that position after pit stops, while Reddick restarted up front after taking only two tires. I knew we had a good truck. I just paced myself early. Busch suffered a pit road speeding penalty and was forced to re-pass the field, which he once again did with ease. "Early on, I was patient with it," Busch said. "I knew we had a good truck. I just paced myself early." His teammate, Darrell Wallace in the No. 54 Kyle Busch Motorsports Toyota ran second and then took the lead just before lap 60 after Busch reported an overheating problem. Busch was pulling away to a lead of about six seconds by the time the field began cycling through green-flag pit stops with just under 50 laps remaining. The yellow flag, signaling the third and final caution of the race, waved during that cycle of stops. Dillon came out with the lead and Busch was forced to try to retake the lead, a task that proved difficult. Busch used a lap truck to block Dillon and took point once again on lap 134, driving away with the victory. Wallace finished sixth, the No. 31 Turner Scott Motorsports Chevrolet of Ben Kennedy was seventh, the No. 21 GMS Racing Chevrolet of Joey Coulter eighth, the No. 8 SWM-NEMCO Motorsports Toyota of Joe Nemechek ninth, and the No. 99 T3R Motorsports Ford of Bryan Silas rounded out the top-10.